A fun weekend activity is to visit the rugged West Coast Beaches of Vancouver Island! Explore the diverse marine life caught in the small pools of salt water which have been left behind in the small depressions of the rocks as the tide recedes. The marne life of a tide pool such as Starfish, Anemones, Sea Urchins, Snails, Crabs and a variety of plant life (just to name a few) must survive the extremities of this environment. First the relentless pounding of the ocean where they cling onto the rocks to avoid being swept away. Then as the waters recede revealing the rocks and leaving small pockets of water, these life forms must endure the heat of the sun or avoid being dried out or eaten. So, spare a thought for these vulnerable creatures when you next clamber over the rocks and reach into the warm tide pool to pull one from their home, their life is a fine balance already. 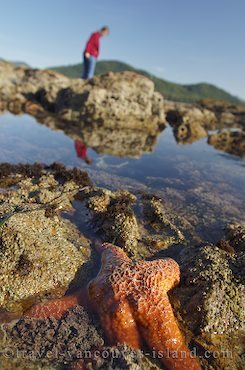 Starfish and a person exploring the tide pools on the West Coast of Vancouver Island, British Columbia, Canada. in the rock beside a tide pool.